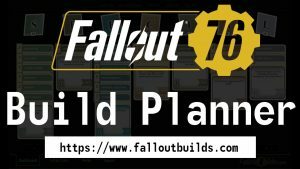 Welcome to FalloutBuilds.com`s Fallout 76 Build Planner! Die deutsche Version des Build Planers findest du auf Vault76.de. Plan your Fallout 76 character with our Fallout 76 Build Planner und share your build with friends, in communities, on Reddit etc. To share your build just copy the URL from the adress bar in your browser or use the Export tab within the Build Planner itself. ✍️ Create a new topic in our feedback forum for bug reports or feature suggestions. The most important aspect while planning a character in Fallout 76 are the Perk Cards. For this reason most of the builds will start by picking the Perk Cards first and distributing the S.P.E.C.I.A.L. in the end to match the selected Perk Cards. To make this easy you can find the AutoOptimizer™ in the tab “Stat”. The AutoOptimizer™ will choose the perfect amount of points for each S.P.E.C.I.A.L. for you. You can disable it to get full control over the spent points, if you wish to vary from the optimal points distribution. The Perk Cards itself are chosen in the tab “Perk”. Here you filter them by name or required level to use them. Use the search to group perks by keywords like “heavy gun”. Our Fallout 76 Build Planner has a whole tab to adress you stats. It is called “Stat” and here you can add buffs, mutations and distribute S.P.E.C.I.A.L. points. When you start playing Fallout 76 you automatically have one attribute point in each S.P.E.C.I.A.L. Each level up you can spend another point in one of the seven attributes (Strength, Perception, Endurance, Charisma, Intelligence, Agility and Luck). Beginning at level 2 up to level 50, that’s a total of 49 points that you can spend. Everytime you get a point, you can also choose a new perk card. As soon as you reached level 50, you won’t get any more attribute points to spend (but you will receive more perk cards). The points maximum per attribute is 15 – that means that you can’t spend more than 15 points in one attribute. Good to know: You can’t reset your S.P.E.C.I.A.L. points – so it really is important to plan ahead! Strength: Affects how much you can carry, and the damage of your melee attacks. Perception: Affects your awareness of nearby enemies, your ability to detect stealthy movement, and your weapon accuracy in V.A.T.S. Endurance: Affects your total Health, the Action Point drain from sprinting, and your resistance to disease. Charisma: Allows you to share higher point Perk Cards and also affects your rewards from Group Missions and prices when you barter. Intelligence: Affects your ability to hack terminals, the condition and durability of items that you craft, and the return you get from scrapping. Agility: Affects the number of Action Points in V.A.T.S. and your ability to sneak. Luck: Affects the recharge rate of Critical Hits as well as the condition and durability of items that you loot. If you want to create a full character build for Fallout 76 you can take publish it in our forum for Fallout 76 Build Guides . Every build that gets posted there will also be visible in our Fallout 76 Builds Directory.